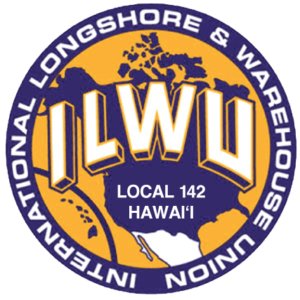 Bobby Andrion moves up to head ILWU Local 142 Maui Division. When I asked if I could email Bobby Andrion some topics I wanted to cover in a profile, the newly elevated head of ILWU Local 142’s Maui Division sheepishly admitted he wasn’t particularly tech savvy and his email wasn’t working right. A grinning Steve Castro, Andrion’s immediate predecessor, standing nearby, offered use of his email. When I arrived at the Union’s Hall on Lower Main Street, Andrion is just completing a meeting. He comes towards me and is promptly presented with a stack of material that require his review and approval. He starts to look through the papers—invoices and purchase orders and letters—then decides he’ll handle the task later. He scoops up the stack and leads me back to the first-floor conference room. In a flurry of leadership roles busying his normal workday, Roberto “Bobby” Andrion makes time to expound upon the responsibilities of his newly acquired role at ILWU Local 142’s union hall. Roberto “Bobby” Andrion, Jr. is running around from meeting to meeting at ILWU Local 142’s spacious union hall on Lower Main Street. With Castro still finishing up work in the Second Floor office of the Division Director, Andrion is working off a desk in the reception domain where longtime ILWU division secretaries Joycelyn Victorino and Joyce Naruse hold sway. He looks at me warily. The sixty-one old year maintains a toned figure that you imagine still fits a tailored formal uniform of an army officer, which he was. Andrion honed his military bearing while serving six years of active duty Army at the tail-end of the Vietnam War (1974-80). He then spent about a decade in the Hawai‘i National Guard, attending OCS at Benning (he uses shorthand jargon at times like other Veterans—you assume he means Fort Benning) to get his officer bars. He retired as a Captain sometime in the early 1990s—Andrion doesn’t appear to be a person who dwells too much on past details. Probably when the first and second battalion merged, he offers, which is when a lot of Guard Member positions were shifted to O‘ahu. I’d known some Guard members who commuted to complete their State service from Maui but he said he wasn’t interested in living anywhere else. 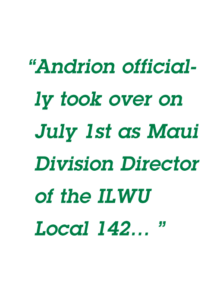 Andrion officially took over on July 1st as Maui Division Director of the ILWU Local 142, Hawai‘i’s largest private sector union with approximately 18,000 members statewide. Six Thousand of those members work in Maui County. While perceived as a largely Filipino union, the membership of the ILWU is quite ethnically diverse given the various businesses that have been organized in the years since Statehood. He thinks that part of the perception persists because many members choose not to attend meetings. Despite growing up in Hawai‘i, he considers himself still fluent—very fluent—in Ilokano. It’s a skill that he thinks the Filipino members appreciate—they like to hear the language spoken he says matter of factly. He also picked up some Tagalog while in the military so he has that in his arsenal as well. Bobby Andrion signs documents while on the job as head of ILWU Local 142’s Maui Division. His grandfather was an early Sakada who came to work on the Hawai‘i plantations. He was also one of those who eventually returned to the Philippines in the 1930s. Andrion’s namesake and father was a 1946 Sakada. Emme Tomimbang featured Andrion, his father Roberto Sr. and his son Christopher in her 2006 documentary “Mabuhay with Aloha” as three generations who worked in the sugar industry. She used them to illustrate the changes in job opportunities in Hawai‘i’s sugar industry. Roberto Sr. was a field worker. Bobby was an HC&S Machinist. And Christopher worked as an electrician on the HC&S bagasse power generator with a specialty in fiber optic systems. Including his grandfather, four generations of Andrion’s family labored in the sugar industry and at least the latter three were all ILWU members. Andrion’s three sons from his first marriage (Christopher, Rudolfo and Charles) all worked at some point for HC&S—the youngest, Charles, was among the last employees laid off when A&B’s corporate overlords closed the Maui farm in 2016. Chris now works as an Adult Corrections Officer at Maui Community Correctional Center, Rudolfo is a Spectrum Cable Installer while Charles has moved on to the Grand Wailea. Andrion is not a Maui native but he might as well have been. Born in Bantay, Ilocos Sur, a six-year old Bobby arrived on Maui in 1962 with his mother Estefania and his two siblings Elisea and Rodolfo. His sister now lives in Las Vegas while his parents and brother have passed away. Except for six years on active duty, Andrion has lived over forty-five years on Maui. 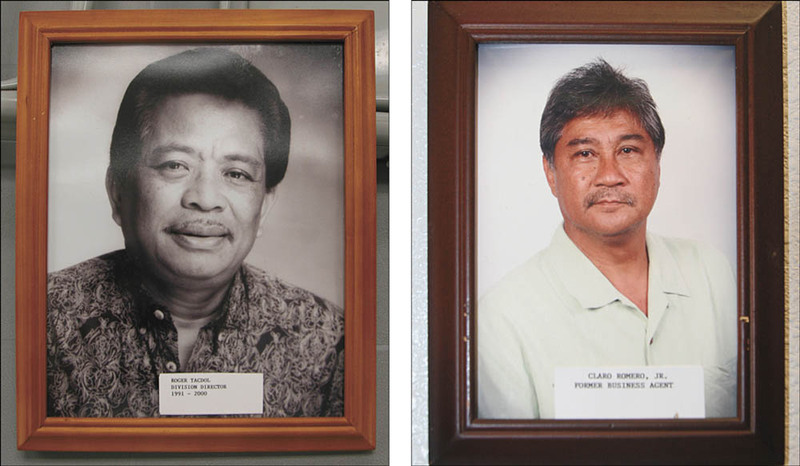 Framed photos of members and retirees grace the Union Hall’s wall—among them are former Maui Division Director Roger Tacdol (left), and former Business Agent Claro Romero, Jr. There are photos on the wall in the Union Hall where most large gatherings of members and retirees take place—framed 8˝ by 12˝ photos of former Maui Division Directors: Tom Yagi. John Arisumi. Roger Tacdol. William Kennison. Steve Castro. Smaller pictures of current Business Agents hang below the Directors. We had strolled in there to check whether the dates that prior Division Directors served are posted with the photos. I had asked about Roger Tacdol, the only other Filipino who has served as Maui Division Director. Andrion’s present photo is still in the Business Agent section. One of the secretaries notes they should get his photo enlarged and displayed in the place of honor. A bemused Andrion pauses stiffly and it’s obvious in his body language that he hasn’t thought of that and likely doesn’t consider it a priority. There’s a lot of work to do and he’s already devoted nearly an hour to this interview. The ILWU has contract negotiations ongoing. A new contract for the Andaz’ 350+ member unit has just concluded and talks for the Hyatt Maui’s 600 or so members are about to start. It’s also an election year and the ILWU endorsement and help remains a highly coveted prize. But in Andrion’s view, that’s all part of what happens in the union. Unlike some other unions, all ILWU officers are elected by the membership and come from the rank and file of the union. Andrion is filling in the final months of Castro’s term and will need to stand for election this Fall for a three-year term that begins in January 2019. He was hired, he says, as the last fulltime Machinist at the Pā‘ia Factory (old HC&S hands refer to the Mills as “Factories”). After him, the plantation hired only millwrights and other positions instead. He eventually moved to the Pu‘unēnē Factory and in 2004 decided to stand for election as a Business Agent. Before then he’d been a union organizer off and on for 4–5 years. His change to union organizing was methodical. He said he did it a year at a time. Roger Tacdol, former Division Director and the first Filipino to hold the Maui Division Director post, recalls Andrion coming to him and asking for his blessing when Bobby finally decided to run for Business Agent. Andrion won that first election and has been re-elected to additional terms, most recently in 2015 where he garnered the most votes: 1432. Claro Romero (1316), Stephen West (1262), Joseph “Joe” Aquino (1197) and Jerry Beth DeMello (1101) were the other elected Business Agents. His military experience, he grants, helped him maneuver through the operations and administrative structure of the union. He enjoyed addressing problems for the members but he still remembers the ones he couldn’t help despite his best efforts. Those are the hardest to accept and the memories stay with him. I ask him why he wanted the current job. Only a few weeks into the job, he says, “I knew it would be challenging.” He admits that he thought the job would be easier than dealing with the different units. A key difference he observes is the need to be a better communicator with the rank and file generally. His time with the union has reflected the changes in membership as the plantation era wound down. As a new Business Agent in 2004, Bobby began by handling the HC&S unit, including clericals. Over the course of his terms with the union, membership has continued expansion beyond the agricultural workers that built the ILWU as one of the most influential labor organizations in Hawai‘i. Today, the ILWU has units working at golf courses (grounds and guest services), Foodland and Star Market, as well as visitor industry employees at the Royal Lahaina, Andaz and Kā‘anapali Ali‘i, and medical technicians at Kaiser Permanente and Liberty Dialysis. Andrion says that the union needs to constantly evolve because the community and the State is always going through changes. As industries and businesses change, whether through competition locally or globally, or as technology shifts American businesses from muscle jobs to brain jobs, Andrion sees the need for the union to be adaptable. He points to the downturn of large-scale mono-crop plantations—“Agriculture is no longer King”—in the islands and the dominance of the tourist industry at present. The union membership had to diversify to remain relevant for workers. As Hawai‘i’s economy shifted from its agrarian roots to more service-oriented industries, the union has had its critics who believe the ILWU has also shifted away from its radical past. After all, it was ILWU leaders who were tried in the infamous Communist trials of the post-World War II era. And it was the ILWU that held the first successful strike against the plantations and after the war brought Hawai‘i’s docks to a standstill with a long 79-day strike that shut down 33 of the 34 plantations. The single ethnic strikes such as those led by Pablo Manlapit of the Filipino Federation of Labor, that resulted in the 1924 Hanapēpē Massacre, had been unsuccessful. [The historical 1924 Hanapēpē Massacre continues to draw interest on Maui, including in the performing arts. See sidebar, left.] Then, of course, the ILWU forged an alliance with Honolulu policeman Jack Burns and returning Americans of Japanese Ancestry (AJA) veterans to form the foundation for the Democratic Party that not only overturned the Territorial GOP oligarchy controlled by haole business interests but has now become the modern status quo. Now, critics complain, the union leadership is apt to side with developers and corporate interests that have co-opted not just the Democratic Party but also its union allies. The criticism doesn’t surprise him. He acknowledges the militant heritage of the union. He talks about it matter of factly. He doesn’t foreclose banging heads with management when necessary. But he notes that building some rapport with the people he’s negotiating with—the human beings sitting on the other side of the table—can be just as productive a strategy as being adversarial. He doesn’t say there will never be strikes. But he says they will look at strikes with an understanding of the impact on the members. He notes that when Maui Land & Pineapple (MLP) closed its farm, former executives and supervisors formed Maui Gold Pineapple (more formally known as Hāli‘imaile Pineapple Company – HPC) to continue growing fruit as a business. Now that group has shifted as well, selling HPC to the distillers of Ocean Vodka who use the juice by-product of the pineapple operations. And the ILWU successfully negotiated a contract for the workers who moved from MLP to HPC. As a former organizer, he also points to the need for more organizing although the units will be in smaller and more discreet segments of the workforce. But he doesn’t foreclose pursuing organizing agricultural operations if the opportunity presents itself. It’s not an immediate part of the plan but he’s aware that the corporation, after all, still owns 36,000 acres of agricultural land in Maui’s Central Valley with a 24,000 acre chunk designated as difficult-to-urbanize Important Agricultural Lands. The ILWU, he says, is not actively trying to organize the only other large operation on the island, Monsanto. As Division Director, Andrion spends more time in the office. Daily he finds himself wondering how time goes by so much faster than his day as a Business Agent visiting and tending to his units in the field. Each day he’s surprised to look up and realize it’s time to go home. His wife Emerina, I think to myself, must be very understanding. Then with a slight grin, he admits, “The only difference in election year is being out there [in the public] more.” But he reminds me that even in off-years, union leadership and the rank and file do a lot of groundwork visiting and talking story with elected officials, industry chiefs and community leaders. While the ILWU has had a large Filipino membership and while there have been Filipino leaders on all the islands, Maui has had only a few. 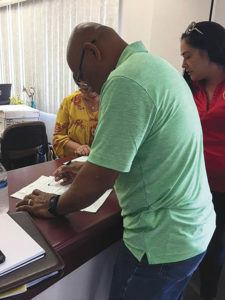 Until Andrion, Tacdol had been the only other Maui Filipino Division Director while men like Pepito Ragasa and Claro Romero have been elected as Business Agents. Valley Islanders Teddy Espeleta has been a Statewide Vice-President and Donna Domingo is the current Statewide President. The former Director Tacdol observes that he didn’t think there would be another Pinoy Division Director for a long time. He notes he’s glad to be wrong. Gilbert S.C. Keith-Agaran is a Wailuku attorney. His parents were both members of ILWU Local 142 as agricultural workers on Maui.